Need a low cost family SUV? Step this way. Choose the Dacia Sandero Stepway and get so much more for your money. This rugged crossover combines fantastic value, good looks and superb practicality at a price your family can afford. The Stepway offers you alloy wheels and handsome design on the outside; space and style inside. Tricky parking spot? There’s no more guesswork with the Stepway’s built-in rear parking sensors, available as standard on the Laureate trim. Add a reversing camera, and you’re good to go. 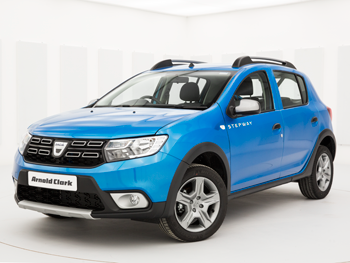 The Dacia Sandero Stepway combines comfort, space and capability. With 320 litres of boot space, handy roof bars and towing capacity, a family adventure is just around the corner. Need to make a hands-free call or listen to music on your phone? The 7-inch MediaNav multimedia system allows you to keep connected, entertained and on track with satellite navigation. 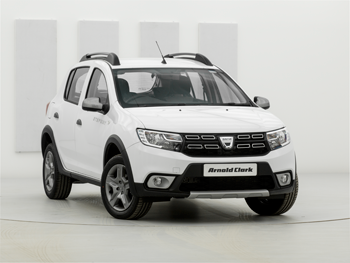 The Dacia Sandero Stepway has a choice of a turbocharged 900cc petrol engine and a powerful 1.5-litre diesel engine, and comes with plenty of kit as standard.